Olivia continues her reimaginations of Films with an 80’s Cult Classic; Ridley Scott’s Legend starring Tom Cruise, Mia Sara, and the amazing Tim Curry. In the newest edition of The Revamp. 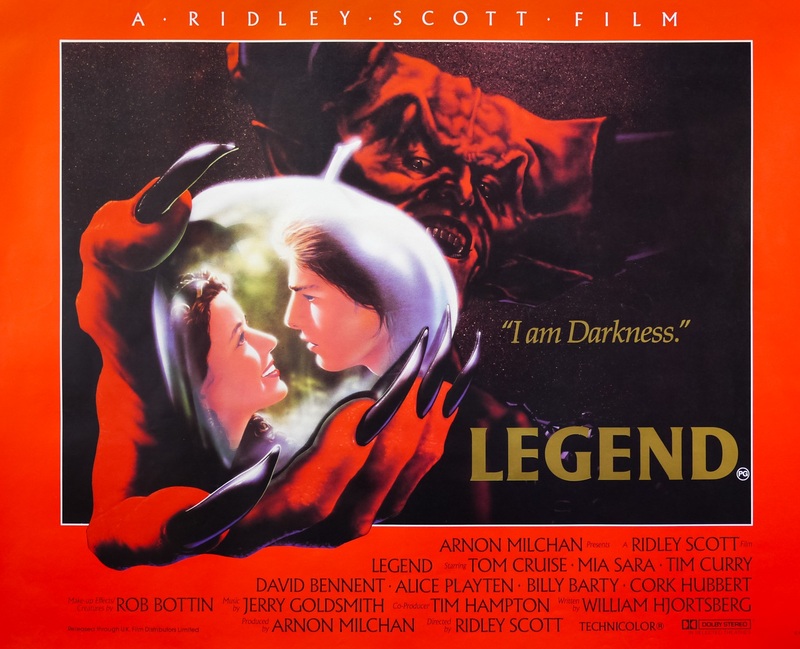 The first time I screened Ridley Scott’s Legend (1985) was without dialogue or sound, and caused me to miss out on the conversations at the dinner table at Melt in Cleveland, OH. While most remember their first Melt experience for the gooey and delectable food, I instead remembered it for the silent and dated fairy tale that was playing on the TV behind the bar, and how in attempting to discreetly catch glimpses of it I strained my neck. While most critics and committees such as Roger Ebert, the Academy of Motion Picture Arts and Sciences, and the British Society of Cinematographers praised the production design and aesthetics more than the rather predictable ‘save the damsel and the world from evil’ plot and the casting (despite acceptable performances from Tom Cruise, Mia Sara, and the legendary Tim Curry), the cult classic clearly still struck a lasting chord with audiences, both old and new like myself. There is also something to say about the almost fateful and rewarding collaboration between the various production departments, and the numerous people who worked under the leadership of those departments (notably director of photography, Alex Thomson; makeup artists, Rob Bottin and Peter Robb-King; head of wardrobe, Charles Knode; composer, Jerry Goldsmith, and heads of production design/special effects, Assheton Gorton, Nick Allder, Kent Houston, Peter Melrose, Dave Jordan, Jim Morahan, and John Fenner). While naming each individual would cause this column to be several pages long, their effort is appreciated. So how does one exactly revamp a cult classic, when the ‘genre’ itself contains films that are treasured for their uniqueness and individualism? How does one remake a film that has a solid following, and not risk that following despising the production company for their new vision? While there are no clear cut answers, here are a few suggestions to consider. DP: Alex Thomson (Hamlet (1996), Excalibur (1981), and Superman (1978)). Wardrobe: Charles Knode (Blade Runner (1982), Braveheart (1995), and The Life of Brian (1979). Production Design/Special FX: Assheton Gorton (Production Design), Nick Allder (Special FX supervisor), Kent Houston (Visual Effects but uncredited), Peter Melrose (scenic supervisor), Dave Jordan (property master), and Jim Morahan and John Fenner (assistant art directors). Composer: Jerry Goldsmith (director’s cut). Cast: Tom Cruise (Jack), Mia Sara (Lili), and Tim Curry (Darkness).